Since we've been studying arch bridges, I thought we'd look at a closed spandrel arch. These bridges are constructed by forming one or more arches and building walls along the sides (and abutments or piers at the ends). The interior is filled with granular material and some kind of deck or road surface is built on top. The Alte Brücke crosses the Main River in Frankfurt, Germany. Its name means 'Old Bridge,' which is not exactly true. Records indicate that a stone bridge has stood at this location perhaps as far back as 782 AD, but this bridge has been destroyed and rebuilt many times, with its latest reincarnation coming in 1965. Actually, the part of the bridge in this photo may be from an older structure, but the arches in the channel have been replaced with steel girders. Note the huge cutwaters in front of the piers. Perhaps the bridge was damaged in the past due to debris carried by a flood. The south bridge abutment is next to an outdoor cafe with stairs leading to the river. This pleasant location attracts many swans (and children to feed them). 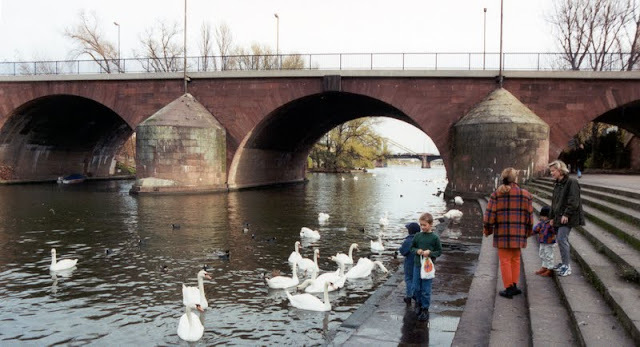 Arch Bridges: Alte Brücke by Mark Yashinsky is licensed under a Creative Commons Attribution 3.0 United States License.